YÊN BÁI — Party General Secretary, President Nguyễn Phú Trọng launched the New Year Tree Planting Festival in Việt Cường Commune on Sunday on the sixth day of Lunar New Year 2019. Almost 60 years ago, President Hồ Chí Minh wrote an article which was published in Nhân dân (People) newspaper, stressing the significance of tree planting to each person, each family and the entire nation. It has since become an annual Vietnamese custom each Lunar New Year. 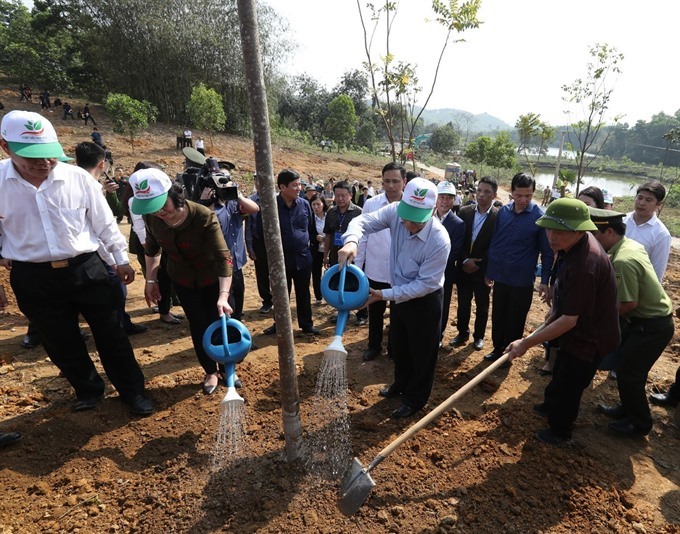 Addressing at the ceremony in Trấn Yên District, in the northern mountainous province of Yên Bái, the leader underlined the important role tree planting plays in society. He said it has helped prevent natural disasters, improved environmental quality and helped livelihoods amid global warming, climate change and sea level rise, which are billed as one of the formidable challenges to the human race in the 21st century. He called upon the entire Party, army and people to grow trees and forests as well as take action against deforestation as part of efforts to protect the environment. According to Minister of Agriculture and Rural Development Nguyễn Xuân Cường, the country planted more than 231,000 hectares of concentrated forest and more than 63 million scattered trees in 2018, raising the forest coverage to 41.65 per cent. Meanwhile, the export of forestry products was estimated at more than US$9.3 billion. In accordance with the Target Programme on Sustainable Forestry Development for 2016-20, agencies and sectors will work to raise forestry production value by 6 per cent annually, as well as forestry export to $10.5 billion and forest coverage to 41.85 per cent in 2019. In Yên Bái Province, noticeable changes were seen in forestry production, with additional 15,443 hectares of forest and the forest coverage reaching 63 per cent.